With the extra large mat, you can enjoy the leisure time with your family for lounging in parks and also on beach. It offers a great relaxation after a busy day. The outdoor mat has large extended size to provide suffucient space for several adults and toddlers. In addtion, it is lightweight and compact. You can simply and quickly roll he blanket up and store in the boot of the car. Top Layer: if it was just stained by drink, pls use the tissues to absorb the liquid till the surface become dry. If the cloth was stained by other stubborn stains, pls wipe the surface back and forth by one hand slightly with warm water and mild soap, and then line dry in the air. Bottom waterproof layer: just wipe clean with damp cloth. √Waterproof and Sand Proof - Adopts excellent quality material (Oxford Cloth) that is highly waterproof and sand proof. It is hard to get the mat wet and the sand on the beach mat also could be shake off easily. √Easy to Clean - This picnic blanket is super easy to clean due to its durable and waterproof backing. Easily shake & wipe off dirt, mud, wet grass, and beach sand. If you have any questions about this product by Anyasun, contact us by completing and submitting the form below. If you are looking for a specif part number, please include it with your message. F-KING Picnic Blanket,Outdoor Waterproof Travel Bag,Beach Blanket In One,Multifunctional Foldable Travel Bag,Dual Layers Sandproof And Waterproof Picnic Bag For Travel, Hiking, Festival, Sports. 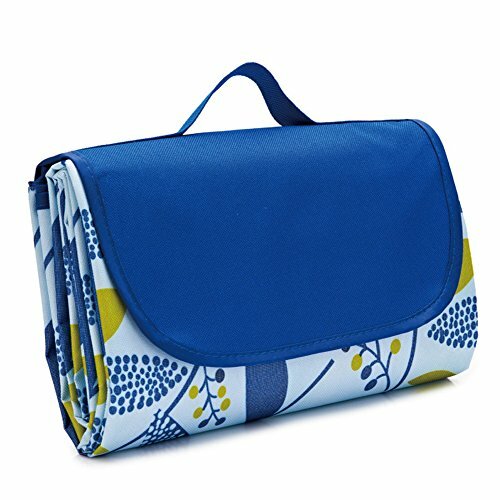 Homey Cozy Large Outdoor Picnic Blanket, Blue Green Plaid Foldable Travel Tote for Beach Camping Stadium Mat Water Resistant Backing -57"x79"